Alert, alert, ranting sub in existential crisis. Well, not exactly. But it’s certainly true that I don’t find too much to rant about these days. Whether that’s because I’ve got it out of my system, I’m working with less rant-inducing copy or I’ve just gone blind, I don’t know. Anyway. The more I know, the more I realise I don’t know. The more I realise I don’t know, the more inclined I am to listen to other people’s voices more and my own a bit less. There was Ralph Fiennes, getting all worked up about Twitter ruining Shakespeare, or something. Blah. Much more interesting was this response on Language Log: Up in ur internets, shortening all the words. 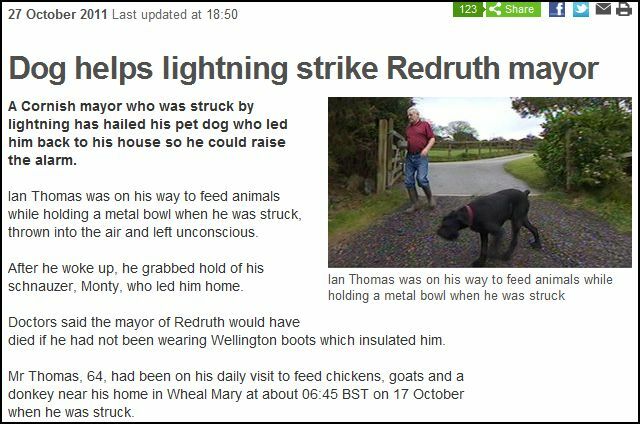 If you weren’t too busy ruining language, you may have noticed that last week, a dog harnessed the power of electrostatic discharge – possibly in protest at local governance: Dog helps lightning strike Redruth mayor. This led me to a lovely post on Stan Carey’s Sentence First blog, on Crash blossoms. There’s a hilarious post on Angry Sub-Editor’s blog, about the danger of promoting a sub-editor: Had they but one neck. And then there was a great battle, or something. The Guardian’s David Marsh wrote a post about the which/that rule for the Mind Your Language blog: That’s the way to do it. The explanation was more in-depth than one I had heard previously, but the rule basically the same. What surprised me was the level of protest. Several people posted to say that the rule was fictitious, baseless and a misinterpretation of something Fowler once said. There’s a good post here: That which is restrictive and Arnold Zwicky has gone one further and collated an inventory of postings on the topic. I’m quite swayed. Obviously, much of what I write/edit is constrained by house style(s). But I’ll admit to a little which/that experimentation outside of work. I know, I’m cuh-razy. Outside of language-focused things, I loved my sister Kaira’s graphic short story on love in a modern age, and also Joseph Stashko’s blog post on shy people (and X Factor). And I don’t even watch X Factor. A big thumbs down, however, to Christina Patterson’s ‘open letter’ to Miriam Gonzalez (aka Mrs Clegg) in the Independent: So good that you make me feel bad. “Seeing pictures of you … makes almost every woman in the country feel just a little bit worse” is the pay-off. Wtf? Speak for yourself, Christina. If you really must. That’ll do for now. I may update this list when I remember what else it is I’ve been reading. Feel free to add further links below. Previous PostGiri giri, fula fula, yula yulaNext PostWhy ‘post’, not ‘after’?